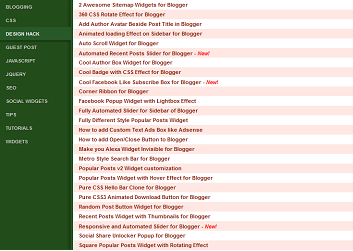 Table of Contents is one of the most Popular Blogger Sitemap Widgets preferred by many bloggers. It helps users to browse your all blog posts / contents easily in a single window. It is very helpful for your blog as it helps to Increase Your Blog Pageviews ! In last post I had explained about "Adding a responsive blogger sitemap widget to your blog" Today we are going to learn How To Add This Cool and Responsive Table Of Contents to your Blog. Its really easy to install on your blog. This widget is made by Taufik Nurrohman of DTE , It contains some CSS and Java Codes which makes this widget totally awesome. 1. You can add this as a page so for that, go to Blogger > Pages > Click HTML Section and copy the following code and paste it in it. 2. Just change http://techethix.blogspot.com to your blog URL. 3. Click Publish ! That's It You are done now ! Important : Please Don't Remove any Link from this widget , it might not work for your blog. Don't Forget to Share This post with your friends and also Subscribe Us via Email ! Thanks for the sharing the CSS. It is quite helpful. I think this code is not working right now.